As we walk through the entrance of Biosphere2, about 40 miles northeast of Tucson, I try to imagine what it would be like to enter this greenhouse-on-steroids knowing I’d be inside for two years. Without leaving. Living on only what I could grow. No coffee. No ice cream. No guacamole. Becoming voluntary prisoners in this giant steel-and-glass bubble is what eight scientists did in September 1991 when they became part of a grand, two-year experiment to see if humans could maintain life in a closed, sustainable ecological system. Today, this honeycombed dome with 6,500 windows is still the site of many experiments and learning opportunities, but no one is locked inside. 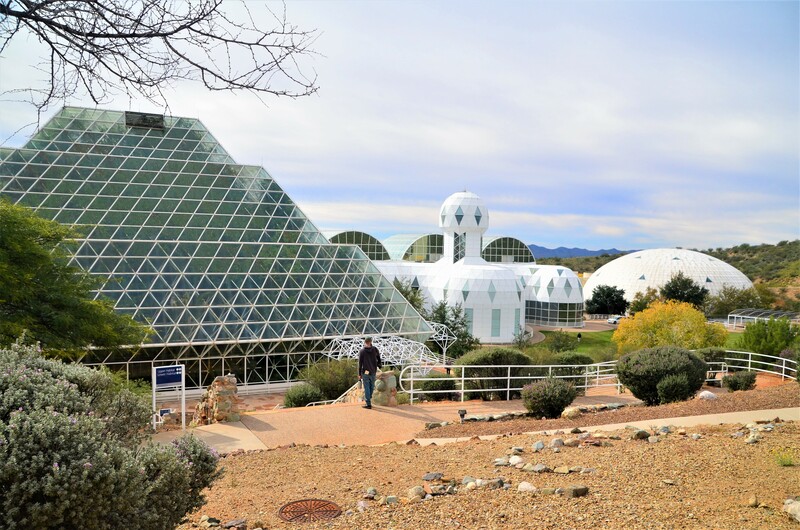 Owned and operated by the University of Arizona, Biosphere2 draws students, researchers and thousands of visitors a year who come to learn about managing the precious resources of Biosphere1 — our planet Earth. I’ve been curious about and fascinated with this futuristic outpost and its mission for years. A recent visit to Tucson and southern Arizona provided the opportunity to finally see what Biosphere2 is all about. At the beginning of our 90-minute tour, an introduction video confirms my suspicion; working and learning here probably would be the most fun science class ever. • A project that tracks how (nonliving) volcanic rock can slowly become rich soil that can support microbes and plant life. • The development of the Lunar Greenhouse to grow vegetables on Mars. • An indoor, vertical farming project that uses LED lights to increase water efficiency and eliminate pests. • Research that focuses on the chemical and biological changes in coral reefs. Like Boy Scouts on the trail, we follow our guide as she takes us up, down and around the various walkways, stairways and catwalks that wind throughout the three-plus acres under glass. We pass through several “biomes,” microcosms of a few of the Earth’s climate zones. 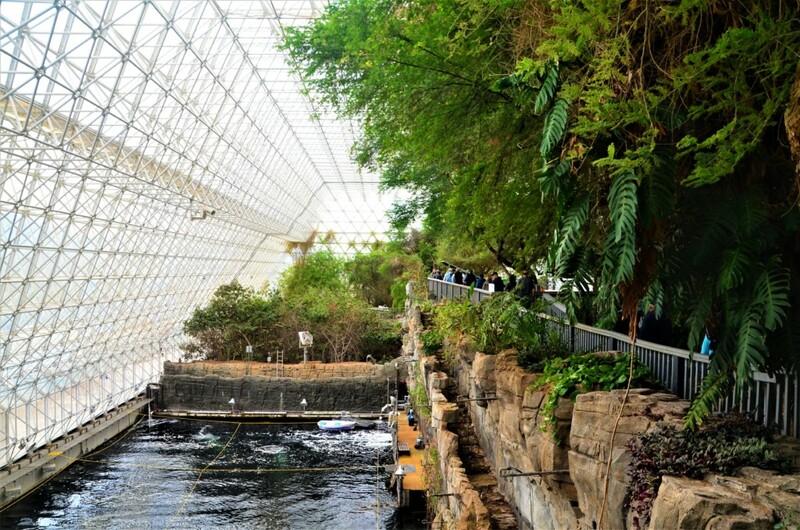 Biosphere2 features five biomes: ocean with coral reef; mangrove wetlands; tropical rainforest; savanna grassland; and fog desert (similar to coastal Southern California). As we pass though this last biome, I recognize many of the plants — mostly cactuses and succulents — that we see in San Diego County. The university also has taken advantage of the other 37 acres on the Biosphere2 campus to meld science and art. As we cruise through the grounds on our own, we discover several sculpture gardens and landscaping that causes my rock-envy to surface. Scattered about in a most artistic fashion are brilliantly colored boulders embedded with deeply blue and green veins of azurite and malachite. It’s difficult to believe that such patterns and color exist in nature. I abandon any idea of tossing one or two in the back of our car when I discover that these incredibly dense pieces of earth weigh between 12,000 pounds and 14,000 pounds each. I settle for a few photographs. For more: http://biosphere2.org. Read about the successes, failures and politics of the two Biosphere2 experiments (1991-1993 and 1994) at https://en.wikipedia.org/wiki/Biosphere_2. If you visit Southern Arizona, make Tucson your base of operations. What to see: Biosphere2; Kitt Peak National Observatory (www.noao.edu/kpno); San Xavier Mission (www.sanxaviermission.org); the artist colony of Tubac (http://tubacaz.com); Titan Missile Museum (www.titanmissilemuseum.org); Wild West town of Tombstone (https://tombstoneweb.com); and Arizona Wine Country (yes, there is such a thing; http://arizonaexperience.org/land/arizona-wines) Where to stay: Lodge on the Desert in mid-town Tucson – rooms start at $105; (833) 257-8800; www.lodgeonthedesert.com.